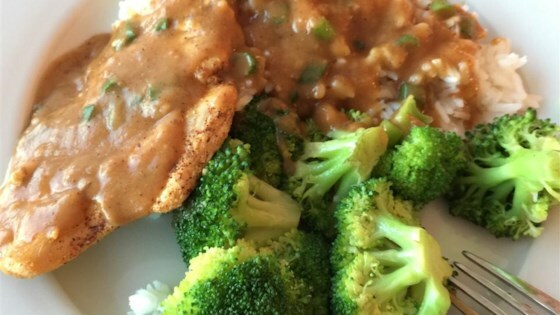 "This delicious chicken recipe includes a simple exercise in pan gravy perfection. If I only had one day to teach someone how to cook, you better believe this archetypal sauce recipe would be one of the first things I'd demonstrate." Place chicken breast halves between two sheets of heavy plastic (resealable freezer bags work well) on a solid, level surface. Firmly pound chicken with the smooth side of a meat mallet to a thickness of 1/2-inch. Season with salt and pepper to taste. Heat olive oil in a skillet on high heat until it begins to shimmer, about 1 minute. Reduce heat to medium; cook chicken breasts until browned and no longer pink inside, about 5 minutes per side. Transfer cooked chicken to a warm plate and loosely cover with aluminum foil. Melt butter in the skillet; stir in flour and cook for about 2 minutes. Stir in chicken broth, scraping up any browned bits from the bottom of the pan; cook and stir until gravy begins to simmer and thicken, 1 to 2 minutes. Stir in green onions and chipotle chile powder. Return chicken breasts to the skillet and cook until heated through, 1 to 2 minutes. See how to make pan-seared chicken breasts in a chipotle and green onion gravy. May substitute chicken stock for chicken broth. For thinner gravy, add more broth or stock. This was awesome and super easy! The only change I made was to scale this to 6 servings and used vegetable broth instead of chicken. Yeah, this was good! Browning the chicken really added to it. I liked dark meat, and left the bone in. O, and I replaced the chipotle powder with chipotle in adobo sauce, minced. awesome!